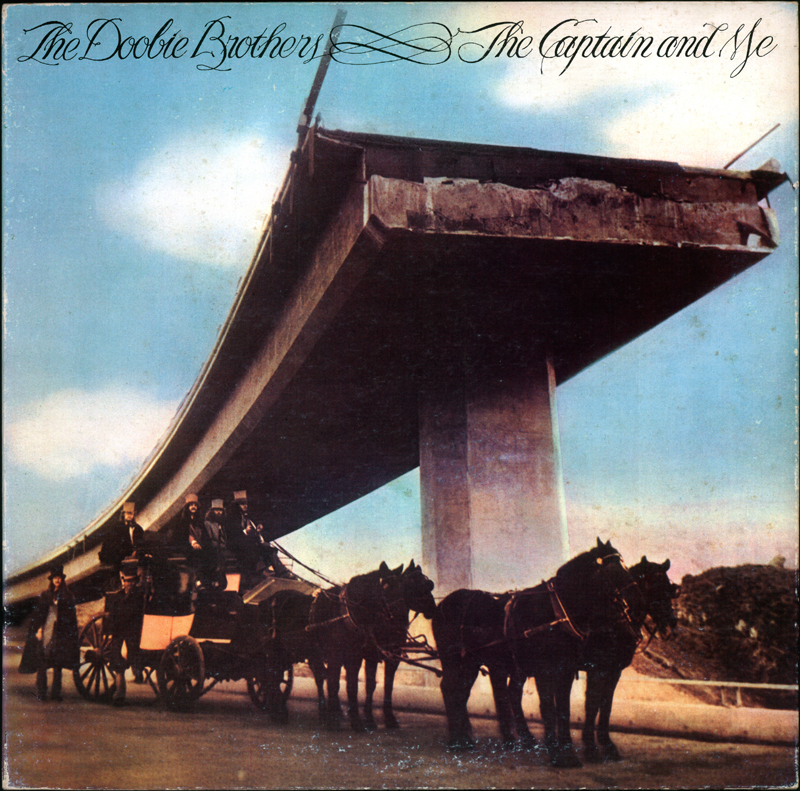 The front, back and inside cover art of The Doobie Brothers' third album, "The Captain and Me" (Warner Bros. Records Inc., 1973), features the band members and manager Bruce Cohn dressed in period 19th-century costume on the Interstate 5 / State Route 14 freeway bridges that collapsed in the Newhall Pass during the Sylmar (aka San Fernando) earthquake of Feb. 9, 1971. Photography is by Michael and Jill Maggid. Props came from the Warner Bros. studio lot. The album went double platinum and reached No. 7 on the U.S. pop charts. The track "Long Train Runnin'" made No. 8 and "China Grove" made No. 15. The Doobie Brothers are Tom Johnston on guitar, harmonica, vocals; Patrick Simmons on guitar, synthesizer, vocals; Tiran Porter on bass and vocals; John Hartman on drums, percussion, vocals; and Michael Hossack on drums, congas, cymbals, timbales. Also performing on the album are Bill Payne, piano, organ, keyboards; Jeffrey "Skunk" Baxter, guitar, pedal steel guitar, steel guitar; Ted Templeman, percussion; and Nick DeCaro, strings arrangement. Templeman is the producer; the designer is Barbara Casado with art direction by Ed Thrasher. The tracks are (Side One): Natural Thing, Long Train Runnin', China Grove, Dark Eyed Cajun Woman, Clear as the Driven Snow; (Side Two): Without You, South City Midnight Lady, Evil Woman, Busted Down Around O'Connelly Corners, Ukiah, The Captain and Me. LW2547a: 19200 dpi jpeg from album purchased 2013 by Leon Worden from a dealer in Japan.